Since she let herself out into the main pasture, I’ve pretty much been letting Holly live her best horse’s life. And it’s true, I was busy taking care of mom and then dealing with her grief, and the roller coaster weather, with it’s effect on my fibro, hasn’t helped. I also figure the more I can let her be a horse with lots of hay and grain and fresh water and soft voices and pretty good, if slightly obnoxious at times, herdmates, well it’ll do her good. And she’s started eating with the other ladies in the afternoons sometimes (Fortune & Firefly), which makes me a very happy horse mommy indeed. 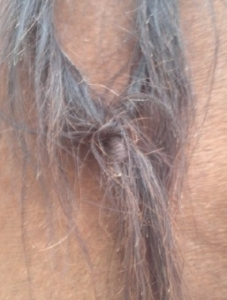 Holly’s long mane gets knotted in a couple of places. I need to take my Cowboy Magic detangler out and remove the knot, if nothing else as part of our continued “I’m not going to hurt you or make you work. I just want to care for you” trust building. (I went out today to take pictures, but the other horses were like LOOK MOM I BET SHE HAS COOKIES (I didn’t) and since she’s lower on the totem pole she walked away. But don’t worry, I did a bit of walking her down, standing there and petting her, taking to her in a soft voice while holding the halter, and she quickly came around. But alas, no pictures of Holly’s fairy knots.) However, I read something that made me smile. Folklore calls these fairy knots, for that’s where the fairies tie knots to ride the horses and hang on while they do so. To remove the knots is to incur the wrath of the fairies, and well, considering that Holly is certainly the flashiest horse out there with lots of gait (oh to have an extra $40 to get her DNA typed) I can see why the fairies would want to ride her. But for now, I’ll smile when I see Holly’s fairy knots, because I bet to the wee little fairies, she probably is a lot of fun to ride.